Decals & Badges include FREE worldwide shipping. Shipping fees apply to all other items unless otherwise specified. When placing orders using PayPal, please provide the part number, year, make, model and color to ensure that you receive the correct decals. If your order includes multiple items, simply list all items and make payment for the total amount. Using this method does not require the use of our order form below. If you prefer to e-mail us with your request, we can send you a Paypal invoice. We are in the process of updating our website with a shopping cart to simplify online purchases. 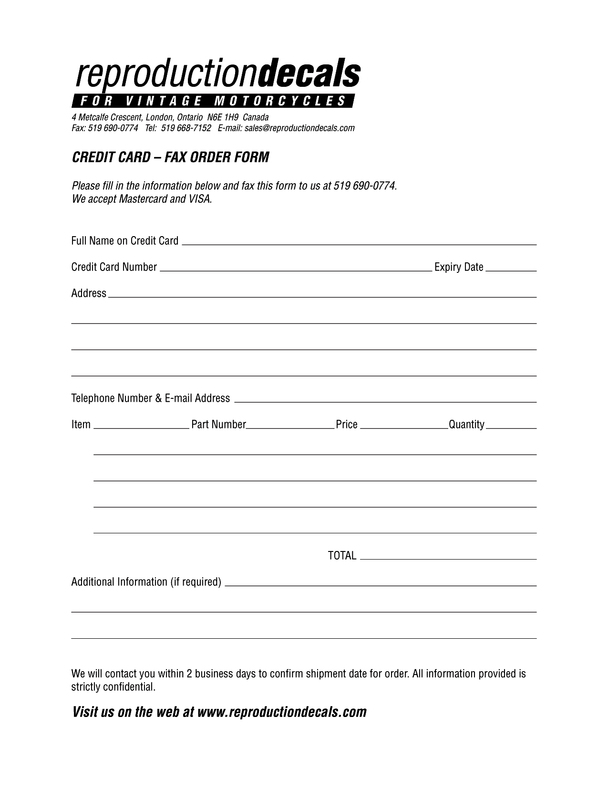 To purchase using a money order, please fill out the order form below. We will promptly reply with your total including shipping if applicable. You can also e-mail us at orders@reproductiondecals.com or inquire by telephone. NOTE: US Money Orders from the US Postal Service MUST be International. 519 668-7152. We accept Mastercard and VISA. You can order using your credit card by fax. ALL decals and graphics and reproduction badges include free shipping by airmail (Canada Post) anywhere in the world. Please allow approximately 10-14 days for delivery by airmail in North America. Possibly longer overseas. This shipping method is not insured or trackable. If you would like to upgrade to faster delivery with insurance and tracking, additional charges will apply. Please contact us for shipping options and a price. Items such as parts DO NOT include free shipping. Please contact us for shipping options and a price. All in-stock items are shipped the next business day. contact us with your order details. or become a member by using the link above.